Tip: Get a $30 coupon for your next AC repair or Air Conditioning service in Punta Gorda! Living in the Punta Gorda heat means you depend on your air conditioning. At Kobie Complete, we understand the importance of responding promptly to an SOS call from a customer whose cooling system needs attention. That’s why our NATE certified technicians are available 24/7 to perform emergency AC repair, turning your residential or commercial location back into a cool oasis. We service and perform warranty work on all makes and models, including but not limited to Trane and Lennox. Even if your air conditioner is still running, you can save money in the long run by upgrading to a more energy efficient air conditioner. For instance, the Lennox XC25 has a SEER rating of up to 25. We will be glad to consult with you as to which air conditioner (or heat pump) best meets your needs and to install your new system for you. We’ll also help you get the most bang for your buck by informing you about current manufacturer and FPL rebates. 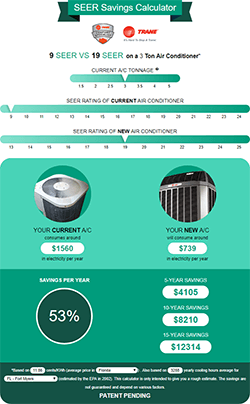 For more details, you can also check out our Current AC Rebates page. Buy a qualifying Trane system from Kobie Complete Heating & Cooling and choose up to $1,000 in instant rebates1 or special financing. Fill out the form below or call us at (941) 474-3691 to get a free, no-obligation quote on a new air conditioner installation. You’ve heard that your ducts might require periodic cleaning, but did you know that traditional methods, using harsh chemicals, might actually damage your HVAC system? This is why we employ a duct cleaning system in Punta Gorda known as duct sanitation, which uses environmentally-friendly methods that won’t harm you, your HVAC system, or the fabrics and surfaces in your home. If you’re bothered by dust or mold build-up and the associated allergies, don’t hesitate to call! We’ll let you know if duct cleaning / sanitation is right for you. Read more about our innovative Duct Cleaning Method. Our Punta Gorda HVAC branch location provides our Punta Gorda and Port Charlotte customers with the with the same top quality air conditioning service we have been offering in Englewood since 2002. So whether you need AC repair, an air conditioner installation, duct cleaning, heating service or just maintenance on your air conditioning / heat pump system, look no further. We are just around the corner! The same AC rebates, financing options and $30 coupon are available through our branch location in Punta Gorda. We carry the most reliable and trusted air conditioning brands (like Trane or Lennox). We not only offer Trane products; we are also a Trane Comfort Specialist. Only AC contractors who uphold very high quality and customer satisfaction standards qualify for the Trane Comfort Specialist title. Need air conditioning service in Punta Gorda? Call us at (941) 474-3691. We’ll be right over! The highest recorded temperature was 102°F in 2005. The lowest recorded temperature was 23°F in 1982. Area: 18.48 mi² of which 14.16 mi² is land and 4.31 mi² is water. The city of Punta Gorda is located directly on Charlotte Harbor across from Port Charlotte, and is connected to Port Charlotte via the Gilchrist Bridge. Punta Gorda, meaning “Fat Point” in Spanish, has a history which begins shortly after the Civil War in the late 1800’s. The city began as a rough industrial community, with some upper-class polish provided by the illustrious Punta Gorda Hotel. Some of the hotel’s famous guests included the likes of Thomas Edison, Henry Ford, and Patty Berg. Even though the hotel is no longer in existence, the city still contains some homes and buildings from its early years, including the A.C. Freeman house, which is now the Town Hall. In addition to the historical sites, visitors and residents alike enjoy strolling in Laishley Park alongside the marina, or shopping at Fisherman’s Village, a unique waterside “mall” with several charming tropical boutiques and restaurants.